Currently, the Innovation Center is at capacity with five startups leasing space. It offers both wet lab and non-wet lab space and office space. Michael Ebinger, Ph.D., the director of the center, says startups there enjoy opportunities to grow in a nice facility. Those opportunities, Ebinger said, depend on what stage the startup is in. However, there is no list of qualifications set in stone just yet because the Innovation Center wants to be flexible for businesses just starting. Being an incubator provides an early boost for startups before they can work with Ignite, the business accelerator that helps more established businesses grow. “We’re interested in taking companies that are starting out and need space to grow,” Ebinger said. WSU Spokane has only been in the incubator business for a short time, but Ebinger and WSU Spokane Chancellor Lisa Brown, Ph.D., are working together to come up with a long-term plan. They appreciate the work being done by Startup Spokane and the Health Sciences and Services Authority of Spokane to help innovators. “Spokane is creating an eco-system of commercialization and WSU is proud to be a part of that,” Brown said. Iasis Molecular Sciences is an example of a tenant in the Innovation Center. It develops materials to address the transmission of infectious diseases. Iasis had space in the old SIRTI building (now the Health Education Research Building on the WSU Spokane campus). 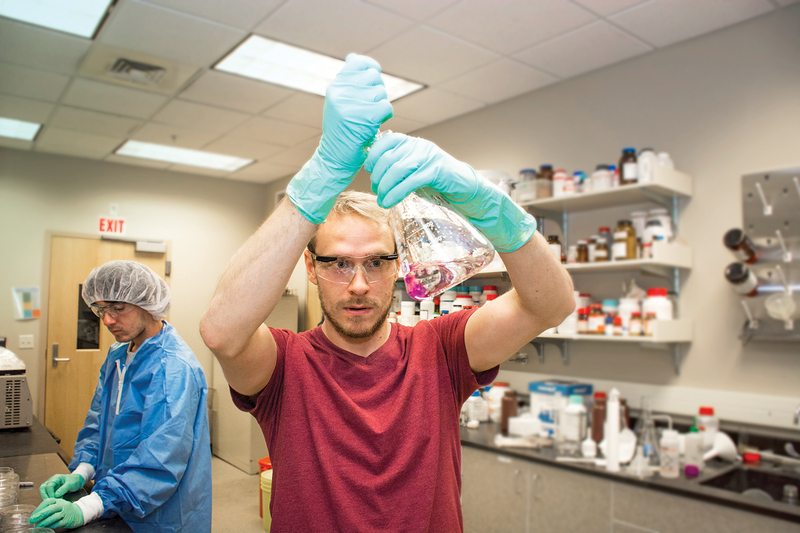 Being near a research university gives companies like Iasis more resources to use. Vachon said his company has collaborated with the College of Pharmacy. He said having access to a university’s research space means his company could be present for research results and feedback, as opposed to working with a lab far away. The WSU Innovation Center is another part of Spokane’s entrepreneur efforts. Pairing research and entrepreneurship in close proximity helps create ideas, jobs and commerce. In between the time businesses begin as an idea and the time they grow to full-blown, profitable companies, there are stages those businesses go through. The Innovation Center and Ignite Northwest work closely to ensure their efforts don’t overlap and that the betterment of the startups is the top priority. “We want to make sure that we aren’t stepping on each other’s toes and that we’re interfacing with each other so that when my clients got to the point where they could use an accelerator, we’d have a nice handoff,” Ebinger said. Allele Diagnostics, Inc. provides rapid and high quality genetic testing services. Biobit, LLC develops antibodies for various assays in food and water products using enzyme-linked immunosorbent assay (ELISA) as a biosensor. ChalkLabs, LLC specializes in Knowledge Discovery and Data Visualization solutions. H-Source is a private marketplace for hospitals and surgery centers to buy and sell medical products and equipment with each other. Novion Technologies/Iasis Molecular develops antimicrobial surface technologies for protecting patients in the clinic from health care-related infections.